The White Dog Blog: Happy Birthday to my girl Sophie!!! Happy Birthday to my girl Sophie!!! Wishing you a first taste of donut awesomeness kind of day today Sophie. And many, many more! Oh, and my mom and dad said to say Happy Birthday too. Oh, and mom also said do you remember the donut store on the way to the farm? Apparently, I come from a long dine of donut lovers. Who knew ?!?!?! Happy Birthday, Sophie. Duncan, you should have a couple of donuts to help her celebrate! Happy Birthday, Sophie! 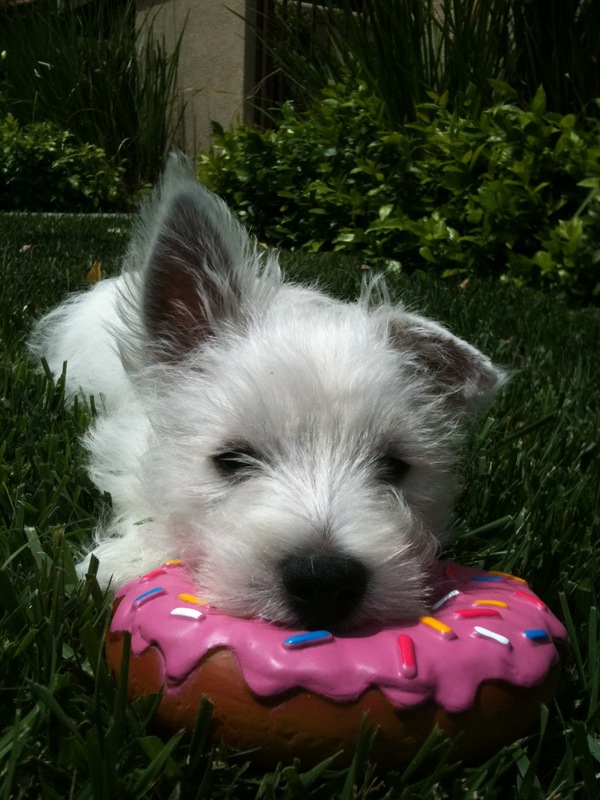 That pretty donut sure looks yummy! Crikey ...... a happy birthday to your girl, Duncan. I hope she gets one of those donuts WITH icecream. Its very important on birthdays to have icecream. Hope Sophie had a great birthday! This is really a helpful blog. This blog will really help to the people who want to online search Best Puppies in USA. Father's Day ... it couldn't be helped! Happy Birthday to the Best Dad Ever!!! !